Perhaps it's Russ? Rossel? Rossatron? Yep, Ross Geller was caught stealing a crate of lager, and people made sure that the right man was going to get caught by flooding the comments with his name every second. Unfortunately, the police came back and said that Ross (David Schwimmer) was actually in New York that night, so it couldn’t have been him. Seriously though, who is this guy? Is it Russ? Is it the Holiday Armadillo? Ken Adams in Mount Tibadabo? It really is a mystery. I hope that the guy doesn’t work there and was just taking his break…we all know how that went down the last time Ross told *someone* that. Besides all the fun and games, the actual thief hasn’t yet been caught, but I’m sure he’s sat at home chuckling away at all the comments. And hey, he’s now become a viral meme which is not that common, it doesn’t happen to every guy and it is a big deal! Well, that’s what they say anyway! 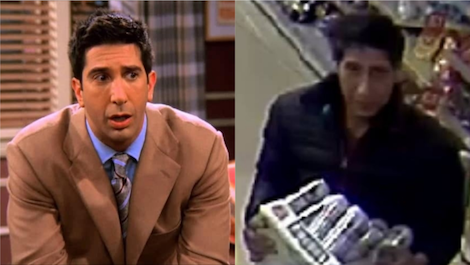 Do you reckon the thief was Ross Geller? Do you think the two actually lookalike? Which Friends reference came to mind when you heard about this? Let us know in the comments, or on Twitter at @WhatsTrending.